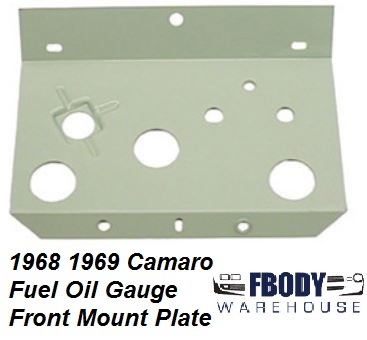 This is a new 1968 1969 Camaro replacement center console mounted oil and fuel gauge front mounting plate for the console mounted gauge pod. For use on 1968 1969 Camaro models. This is a new replacement center console mounted oil and fuel gauge front mounting plate for the console mounted gauge pod. Die stamped steel with correct green coated finish. Console gauge mounting plate fits into base to position fuel and oil gauges. Accurate reproduction.